Itamar Marcus is a member of SPME. There are two layers of media bias when it comes to Israel. The first emanates from the West that focuses on Israel’s “so called” genocidal policies which, because they are not blatantly anti-Semitic are perceived as “legitimate criticism.” The second originates in the Arab-Muslim world. Its accusations are blatantly anti-Semitic and have successfully revived medieval “facts” from the blood libel to the Protocols of the Elders of Zion. But, at the end of the day, both contain and essential layer of anti-Semitism. Western media bias toward Israel has become one of the main soft power weapons for those who wish to demonize Israel in the public eye and generate negative views of Israel in order to pressure Israel to succumb to Palestinian demands. It is also a pervasive tactic employed by groups like the Boycott, Divestment and Sanctions movement (BDS) and the accepted tactic of Palestinian political warfare against Israel, in addition terror and the “armed struggle.” It is founded on the spurious equation of Zionism with apartheid, which was endorsed by the 2001 World Conference on Racism, Racial Discrimination, Xenophobia and Related Intolerance in Durban, South Africa. Now that the campaign to delegitimize Israel online has become pervasive, Israelis are only beginning to understand the need to win on both fronts — the physical and the virtual. For example, in 2008, Israelis living in the West Bank, when filling out the address section of their Facebook profiles, were shocked to discover that they had to choose “Palestine” as their state, with no option for Israel. In contrast to the much-discussed “facts on the ground,” here was a blatant attempt by Palestinians to revise history by creating “facts” online in order to claim that an area of Israel today is a valid Palestinian state, a state which in reality never existed. Even more flamboyant confrontations take place daily on Wikipedia, where Palestinians have sown “destroyed villages” and “war crimes” allegations across the map, even to the extent of claiming that Tel Aviv was founded on the ruins of invented villages. 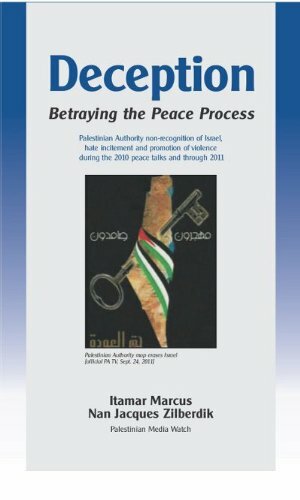 All in all, soft power, that is the ability to influence behavior through values, policies, institutions and culture, as opposed to ‘hard’ or coercive power exercised through military or economic pressure, plays a tremendous role in the Israeli-Palestinian conflict especially when the incitement detailed by Marcus and Zilberdik cascades through Palestinian media outlets into the schools and mosques where the next generation of Palestinian children continue to nurse on the same lies their parents and grandparent were taught. Book Review courtesy of the Jewish Political Studies Review, Jerusalem. Asaf Romirowsky PhD is acting executive director for Scholars for Peace in the Middle East (SPME) and an adjunct scholar at the Middle East Forum and the Foundation for Defense of Democracies.